Studies focusing on the development of morphological novelties suggest that patterning genes underlying traditional appendage development (i.e. mouthparts, legs, and wings) also play important roles in patterning novel morphological structures. In this study, we examine whether the expression and function of a member of the TGF-β signaling pathway, decapentaplegic (dpp), promotes development of a morphologically novel structure: beetle horns. Beetle horns are complex secondary sexual structures that develop in the head and/or prothorax, lack obvious homology to other insect outgrowths, and vary remarkably between species and sexes. 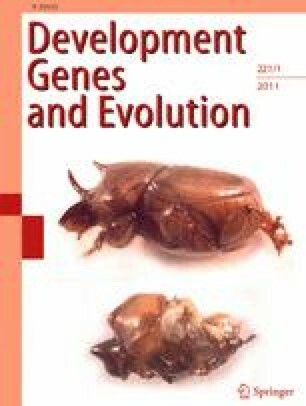 We studied dpp expression through in situ hybridization, performed functional analyses with RNA interference, and gathered allometric measurements to determine the role of dpp during both pronotal and head horn development in both sexes of two morphologically dissimilar species in the Onthophagus genus, Onthophagus binodis and Onthophagus sagittarius. Our findings show that in addition to affecting growth and patterning of traditional appendages, dpp regulates beetle horn growth and remodeling. The online version of this article (doi: 10.1007/s00427-011-0355-7) contains supplementary material, which is available to authorized users. We would like to thank David Angelini for providing primer sequences, Franck Simonnet for mouthpart dissection and imaging, Justin Kumar for access to a NanoDrop 1000 Spectrophotometer, and the Center for Genomics and Bioinformatics at Indiana University for quantitative RT-PCR resources. We would also like to thank Erin Yoder for expert beetle care and Will Haines for collecting and sending O. sagittarius from the field. Finally, we thank Emilie Snell-Rood and Amy Cash for constructive feedback and helpful comments on earlier versions of these results. This research was carried out while BRW was supported through NIH Genetics Training Grant (2T32 GMOO7757-29) and NSF-IGERT Grant (DGE-0504627). Additional support was provided by NSF grants IOS 0445661 and IOS 0718522 to APM.